Remember that SAA survey you completed last year? Well, one of the common themes was that everyone wants to cycle faster than JM and Dianne. Who wouldn’t? They’re consistently at the top of their age groups and make cycling look effortless. Well, here’s your chance to learn how to finish ahead of them. SAA is pleased to introduce a new coached bike program! The program will include 1 indoor orientation session and 4 outdoor specific skill rides over an 8 week period over April and May. The program is targeted at the intermediate and above rider who is looking to further develop their cycling skill. The outdoor rides will be on Saturday mornings for 90 minutes, and those who still have the energy can continue to ride after the session if you need to get in greater distances. Our coach will be Barb Morris of Performance Coaching. 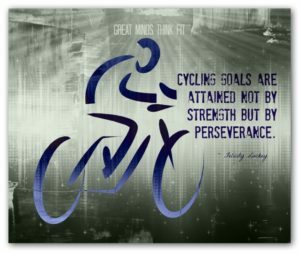 Barb is an elite cycling coach, who has been coaching for over 20 years, racing for over 25, and is passionate about bringing people to the sport of cycling as a newcomer, or helping experienced riders with their goals of being the best they can be. 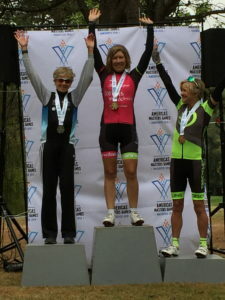 She has worked with many cyclists and triathletes at all levels. See more about Barb’s bio at the end of this post. The cost for the entire package will be $90. There are only 10 spots available so sign up today so you don’t miss out on this exciting opportunity! Please email lindac@thesaa.ca to reserve your spot today. Deadline for signup will be April 7th. Enable group rides to be safe, organized, learn how to ride as a safe pack on the road, in pacelines, comfortable with close riding. Reduce the intimidation that less experienced riders feel. Provide training that develops fatigue resistance (power, fitness) in short to long distance athletes. Provide training on efficient climbing techniques. Coach riders on their bike position for effective transfer of power to the pedals. Ride locations: TBD but likely Richmond, Delta (near airport), Zero Ave, etc. Note: Ideally you should know your heart rate zones – either by doing formal testing or perceived effort (this will be discussed in the first session). There is also an option for formal testing if you are a numbers person. Long Term Athlete Development and Sport for Life!